Send in the form today!. It was a 50/50 joint venture company between Transport for London (TfL) and the Department for Transport (DfT) until 5 December 2008 when it became a fully owned subsidiary of TfL. CRL represents a real commitment to the development of new services to tackle the lack of capacity and congestion on the existing network. BFK is a joint venture comprising three of the world's leading tunnelling, civil engineering and construction companies: BAM, Ferrovial and Kier. BFK is constructing two railway tunnels that will run for 6.4km between the Royal Oak portal and the new Farringdon Crossrail station. We are also building the station tunnel caverns at Bond Street, Tottenham Court Road and Farringdon. British Land is a long-standing supporter of the West Euston area and is fully committed to the local community through partnership working with a range of community projects at Regent’s Place. British Land is proud to sponsor the Camden Bangladesh Mela for many years. Discover over two million years of human history and culture. 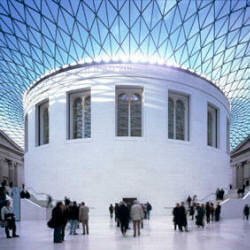 Some of the world-famous objects include the Rosetta Stone, the Parthenon Sculptures and Egyptian mummies. London Borough Council - Full Council is made up of 54 councillors and meets 7 times a year. Every May it appoints the Leader and other members of the Cabinet, allocating their portfolios. Coram's Fields is a unique seven acre playground and park for children and young people living in or visiting London. It includes a Youth Centre, Children's Centre, Community Nursery, Sports Programme, a city farm and a cafe which is open from March until October. The park is open all year round from 9am until dusk and is free and open to children and young people under 16. No adult can enter Coram's Fields without a child and our friendly on-site staff ensure that everyone can enjoy their visit. You can find Coram's Fields in the heart of London between King's Cross and Holborn. The Metropolitan Police Service is famed around the world and has a unique place in the history of policing. It is by far the largest of the police services that operate in greater London (the others include the City of London Police and the British Transport Police). The Royal Parks Constabulary have now become part of the Metropolitan Police Service. Only use 999 in emergencies. Established in 1980, King’s Cross-Brunswick Neighbourhood Association (KCB) is the community’s response to the needs of the residents of the King’s Cross and Brunswick area. Our aim is to improve the quality of life of local residents through the active involvement of people living in the King’s Cross and Brunswick area of the London Borough of Camden. The Mary Ward Centre is London's Adult Education College with a difference. Large enough to sustain a dynamic, relevant range of courses yet small enough to be able to give a first rate personal service to its users. It deserves its reputation as being the friendly place to learn. For more than a decade and half, London Design House has been providing innovative graphic design solutions for both private and public sector businesses and organisations, including new media & print manufacturing industries, ensuring design precision from inspiration through realisation. Whether creating a new brand or developing an existing image – London Design House can help you build and deliver your proposition enhancing your business’s profile and performance. Fortnightly Brick Lane is the bridge between the elders and youths of British Bangladeshi Community in the UK. Its supplement - Youth Lane - is the most vibrant stage for the youths of today to express their talents! Brick Lane aims to connect with local community and youth networks to help them to participate in decisions that affect them; have a voice and campaign on issues they believe in, inspire them to have a positive impact, and gain recognition for their positive contribution to communities, society and the world. Akademi is the leading producers of South Asian Dance in the UK. For over 30 years Akademi has pioneered new visions of dance, synthesising traditional and contemporary influences and cultural exchange. We support young artists to realise their potential and develop as professional performers and cultural leaders through debate, experiment, training and work experience. We treasure the heritage of South Asian dance, the wisdom of experienced artists and provide a powerhouse of knowledge and expertise that we are keen to share widely. "An inner city oasis – a community garden and centre where people grow and learn together taking care of each other and the environment." People from all cultural and diverse backgrounds participate and enrich our activities. Our volunteer and training programme helps people learn new skills, provides opportunity for social interaction and out door exercise as well as offering horticultural training for adults with learning difficulties. Holborn Community Association is a community anchor organisation consisting of Bedford House Community Centre, Millman Street Resource Centre and 1A Arts Centre, in the heart of WC1. It provides a range of core services and special projects to all sections of the local community at the three centres. Friendly, vibrant and inclusive, the centres are open 7 days a week throughout the year. ATN Bangla is one of the largest Bengali-speaking TV channels in the world, and the UK service is an ideal channel to promote your brand or service to the UK Bangla speaking community. The Bengali Workers’ Association (BWA) was originally known as the Bengali Workers’ Action Group (BWAG). The Association was established in 1976 and over the years has steadily grown from being a small group of community activist based in temporary portakabins to being a largest community-led voluntary organisation in Camden serving over 5000 residents from different backgrounds including the Bangladeshi community. The Francis Crick Institute will be an interdisciplinary medical research institute. Its work will help understand why disease develops and find new ways to prevent and treat illnesses such as cancer, heart disease and stroke, infections, and neurodegenerative diseases. 28 Queens Gate, London SW7 5JA. At South Camden Community School we believe that each learner’s success is our core purpose. We aim to make sure that all areas of our school deliver the highest possible standards, and to lead the school community in developing as an outstanding centre for learning in the 21st century. South Camden Community School has been a Specialist Arts College in visual and performing arts for the past 5 years. Our specialist departments - Art & Design, Drama and Music offer students access to high quality facilities, equipment and resources which support their learning in the curriculum and extracurricular projects. Facilities include a theatre, music production suite and visual arts facilities for specialist work including ceramics, photography and printmaking. Founded in 1981, we have been developing well for 25 years. We have built a strong track record in developments that combine offices, shops, hotels, cafés, restaurants and - increasingly - other uses including residential; and have become a leading practitioner of city centre regeneration. The word ‘Mehek’ means ‘fragrance’ and true to its name Mehek has created a wonderful aroma of high quality Indian cuisine in the City of London. Mehek offers a more sophisticated dining experience for those who are seeking to explore beyond the ordinary and discover the full potential of Indian fine dining. Channel S has been voted the most popular Bengali channel outside Bangladesh in 2006. A recent UK survey also found Channel S as the most viewed Bengali television channel in the UK. The voice of the Spice Industry which makes a significant contribution to the UK economy, representing £3.2 billion, 100,000 jobs and the enrichment of the national culinary experience. Spice Business has been organising the British Curry Awards since 2005 with a promise to raise the industry's profile even further with the most glittering awards ceremony beamed by various TV channels to 150 countries across Europe, North America and Asia.